Life is good! Our goal is to provide tools so that caregivers and their loved ones enjoy life! 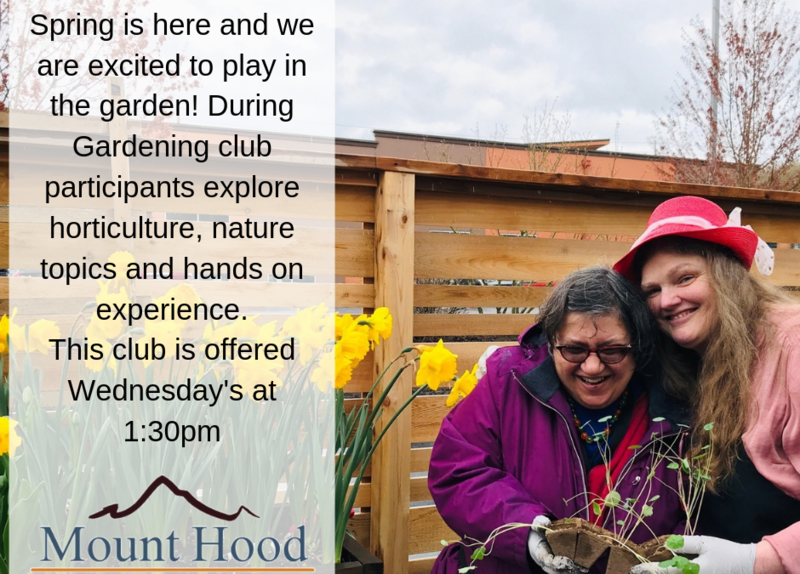 We have been enjoying spring gardening during gardening club on Wednesday afternoons here at the center, here are some reasons why it has many benefits that are worth exploring, check out this article that highlights some of the top reasons to get out in the garden! A garden in full bloom can be pleasing to the eyes and nose. But did you also know that tending to that beautiful garden could have a positive impact on your health? In honor of National Garden Month in April, why not stop to smell the roses—and perhaps plant a few of your own? Improved immune system. Gardening can be a little messy—you’re digging in the dirt, after all! But as it turns out, a little dirt won’t harm you—and it might actually benefit you. Studies have shown that Mycobacterium vaccae, the bacteria that is found in garden soil, can improve your immune system. This “friendly” bacteria has been known to alleviate symptoms of allergies, asthma, psoriasis, and even depression. Relieves stress and anxiety. A study in the Journal of Health Psychology stated that gardening can lower cortisol levels in your brain. Cortisol is necessary for sustaining body functions, but it is also known as “the stress hormone.” When there’s too much cortisol, your blood pressure and glucose levels may fluctuate. However, if you’re handy with a trowel, you can show that cortisol—and those weeds!—who’s boss. May reduce the risk of dementia. One study shows that gardening may lower the risk for dementia by as much as 36% percent. This could be because gardening requires the use of many critical functions, including dexterity and sensory awareness. By spending even a short amount of time gardening on a regular basis, seniors can maintain their motor skills and improve their endurance and strength. Good exercise. While gardening might not seem to be as vigorous a workout as swimming or riding a bike, it is a hearty physical activity. And it’s been proven that even light exercise can help slow down the aging process. You’ll want to add some light stretching before or after spending time in the flower bed to avoid hand injuries common to gardeners, like tendonitis and carpal tunnel syndrome. Happy, happy, happy. Fresh air can do wonders for your mood and your health. So can sunshine. The sun’s rays not only cause your body to produce vitamin D, but it also boosts the serotonin levels in your brain. Serotonin is a chemical that improves your mood and helps you feel calm and centered. This is a big deal for individuals who suffer from seasonal affective disorder, a form of depression that occurs as the seasons change throughout the year. Friendly reminder: While the sun does have its benefits, protect yourself from harmful UV rays and sunburn by wearing sunscreen, sunglasses, and a hat as you garden. If you are looking for an excuse to spend more time outdoors this spring, consider a hobby like gardening that will benefit your physical, mental and emotional health.